Dies ist vielleicht der schönste Strand und Wasser in Nord-Michigan. Dieses Haus (Baujahr 2002) liegt nur zwei Meilen von der Grand Traverse Resort und sechs Meilen von der Innenstadt Traverse City. Der Privatstrand und schöne Sonnenuntergänge sind unübertroffen. Datenschutz und Schönheit alles in einem! Viele Boote für Sie zu genießen .... Zwei Feuer-Pits ..... Doppelbetten und Etagenbetten für alle! PREISE SIND VERHANDELBAR !!! Aktivitäten: Das Hotel liegt nur 6 Meile Fahrt in die Innenstadt Traverse City und etwa eine halbe Stunde zu Boyne Highlands, Charlevoix und vieles mehr! Fläche: Die Hütte befindet sich auf sehr einzigartige Eigenschaft mit keine Straßen oder Autos zu sehen. Es ist ein geschützter Forelle-Strom auf dem Grundstück, wo Sie Steelhead und Lachs zum Abendessen gibt. Nur eine kurze Fahrt von Sleeping Bear Dunes, Traverse City und Crystal Lake entfernt! Lassen Sie uns wissen, dass Sie sie auf dieser Website für Rabatt CHANCEN gesehen !!! Perfect location and perfect beach. We had a great time! We really appreciated the kayaks etc on the beach. Being secluded was great too. Totally recommend! Thank you Heather.... We are looking forward to seeing you again! Thank you for providing such a special setting for our wedding guests. The home was as presented and the property was spectacular. The Trout Stream, Bridge, Beach and Waterfront was simply a perfect setting for all our photos and celebration. We will be back next year! Our 24th annual all chicks was at this house. We have rented from the owner at his other property with no complaints. . Some safety issues with this house are as follows. Bees up and around the deck and property, one of out ladies got stung and 911 was called , luckily she had an epi pen or this could have gone quite bad for her. Queen snakes under the dock on the beach that is now gone. (the beach that is pictured) We had five different encounters with these snakes and it was terrible. Two came up thru the slats as we were sitting there. The beach is gone. We picked the place from the photos and having been to his other property next door several years ago. No toliet paper, kleenex , paper towels or fresh hand soap upon arrival. A trip to the store then. Not a big deal but for the price.... Ceiling chipping off onto the floor in one of the bathrooms, scalding hot water in the showers and all sinks. Yard not mowed, trees and stumps fallen and left in the yard. Back screen door ripped. Others personal items left in bathrooms, and empty lighter fluid and charcoal bag left under the deck. One girls fell on the trail with the exposed roots and got hurt. Paul is a nice guy and we in 24 years have never written a complaint about a house we rented. Clean this place up and put new photos for new guests to see. Interior of the house is roomy and comfortable. I wanted to follow up on our phone conversation. As discussed, we did have an Exterminator onsite immediately after receiving the concerns about the snakes and bees. Dan Cobb, the owner of Cobb's pest control found no evidence of any bee or snake nest anywhere near the beach deck area. As you may have heard, we had a county wide storm which destroyed trees from the Upper Peninsula to Empire, and Traverse City was in the cross-hairs..... I'm sorry that the trees that were knocked over were concerning, but will probably be down around the county forever.... Most of our guests have actually been using the 'downed' wood for campfires. The uneven ground you spoke of is simply a part of the landscape on that shoreline..... The eroded beach was from the storm and elavated water levels, however we created a very special deck on the beach, which we have continued to have positive feedback about.... especially given the timing. Again, we understand that you have been repeat customer(s) and can appreciate the issues we deal with and the appreciation we have for those who return year after year. Our concern in this case is that you waited until you returned home, before notifiying us of any issues. And then actually asked for a FULL REFUND....??? With that said, we hope that we can offer you the opportunity to come back and join us again in the future. Please feel free to contact with any further questions or concerns you may have. Great Place! Perfect family Vacation! I can't say enough good things about this home. We have stayed there two years in a row now and it has become the highlight of my family's summer. It is peaceful and idyllic in every way. Thank you for making your home available! 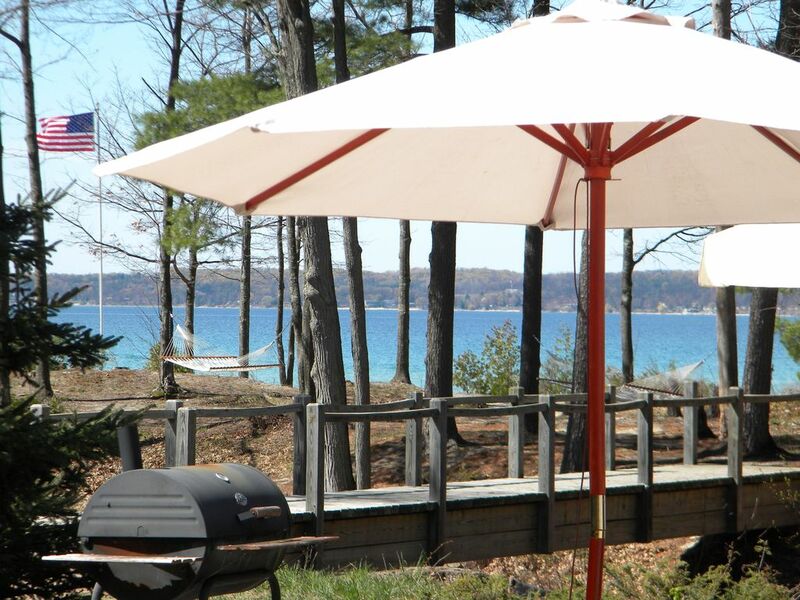 Thank you, Thank you, Thank you..... You have a wonderful piece of heaven on Grand Traverse Bay. The kids are already asking when we can come back. See you next month! It was accomodating for my entire family. We all had fun, i wish i could have stayed longer. The owners were very nice and the place had a great layout. A little sandy and dirty and had to do a bunch of laundry when we first got there. Some small maintenance items were needed, but other than that, it was a great place. We are planning next years already!